In addition to the one-time 80% “catch up” increase that went into effect on August 1, 2016, OSHA’s Interim Final Rule, pursuant to the Federal Civil Penalties Inflation Adjustment Improvements Act, also required the agencies to establish a process for automatic annual updates (by January 15th each year) of civil penalties to keep pace with inflation going forward. OSHA made its first automatic annual update on January 13, 2017, just prior to President Trump’s inauguration. That first automatic increase was a little more than 1% – from $12,471 to $12,675 for Serious and Other-than-Serious citations, and from $124,709 to $126,749 for Repeat and Willful citations. As provided by the Inflation Adjustment Act, the increased penalty levels apply to any penalties assessed after the effective date of the Final Rule. Accordingly, for citations issued on or after January 2, 2018, even if the citations relate to conduct or conditions that only existed prior, the higher penalty authority will apply. What Practical Effects Can Employers Expect? The impact of the catch-up increase back in 2016 was significant for violations of all stripes. The result for Serious violations was to nearly double the average penalty per Serious violation. However, the current program of annual increases has created pretty negligible impacts on Serious and Other-than-Serious violations. 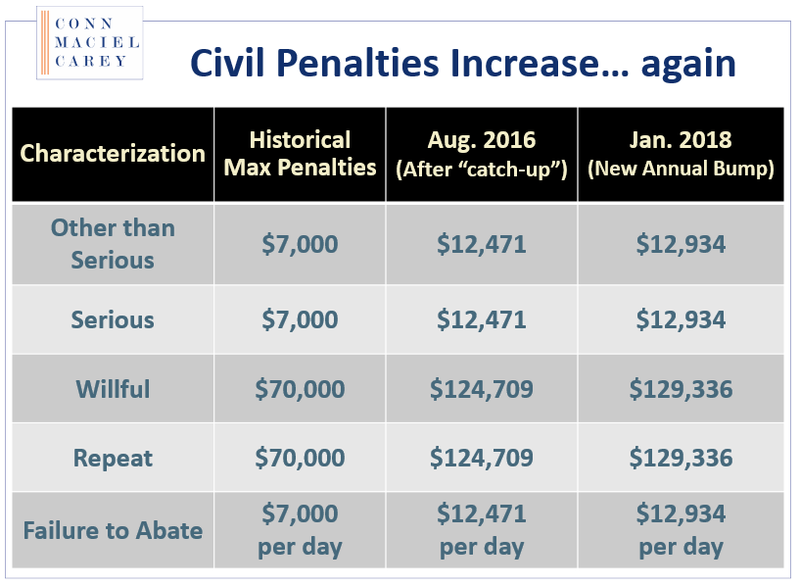 Max civil penalty authority for Other-than-Serious and Serious violations only increased this year by $319, from $12,615 per violation to $12,934 per violation. Conversely, although the percentage increases are minor, the result is still meaningful for Repeat and Willful violations, where the gross dollar increases are measured in the thousands of dollars, from $126,749 to $129,336. 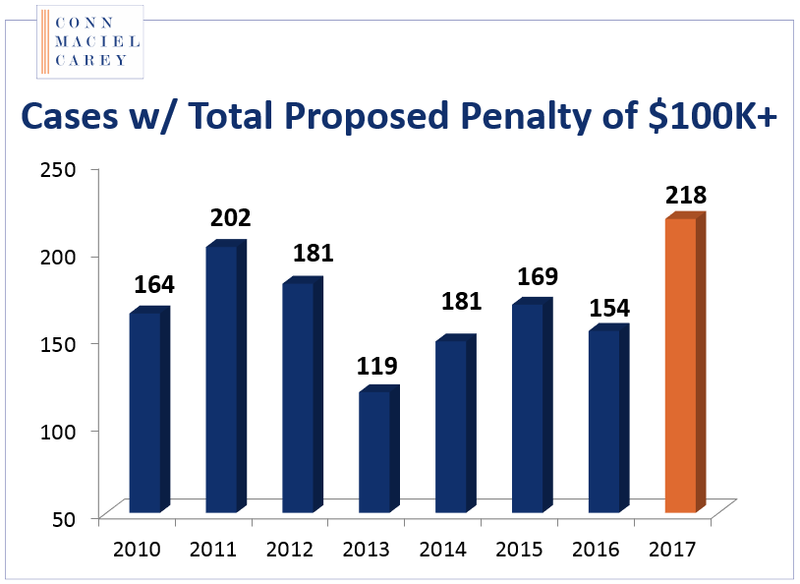 All told, since 2016, the max penalty for Willful and Repeat violations has jumped by $60,000, from $70,000 per violation to $129,336 now. 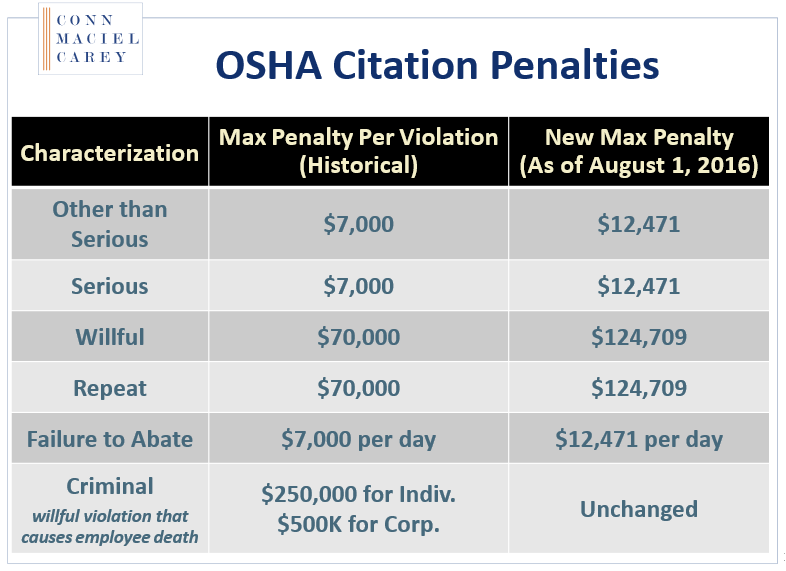 It is important to note that the penalty increases being reported are just increases in the “maximum” per violation penalties OSHA is permitted to issue. More often than not, however, OSHA does not exercise its maximum penalty authority. There are numerous penalty reduction factors that OSHA can apply before citations and proposed penalties are issued. For example, small employers usually get a “size discount,” employers with prior “in-compliance” OSHA inspections get a “good history discount,” and employers who engage with OSHA in good faith during the inspection can get a “good faith” discount. 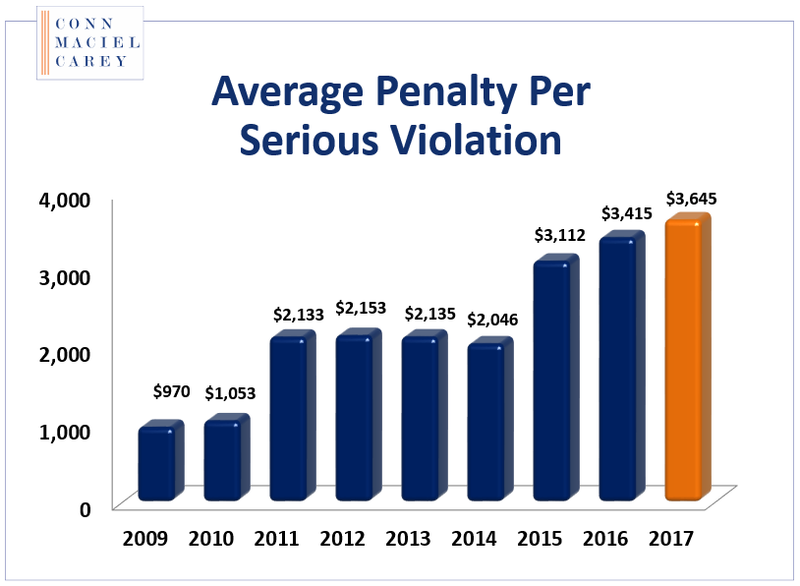 So, despite an increase over the last three years of a max penalty for Serious violations from $7,000 to $12,615, the average penalty per Serious violation last year was only just $3,600. Although Congress did not mandate in the Federal Civil Penalties Inflation Adjustment Improvements Act that the nation’s many fed OSHA-approved state occupational safety and health regulatory programs (e.g., Cal/OSHA, NC OSHA, etc.) must also update their penalty levels, federal OSHA took that upon itself. OSHA notified all of the State OSH Programs that it expects them to adopt penalty levels at least as high as fed OSHA’s new maximum penalty levels to maintain their approved status. Just as importantly as the mandate that the State OSH Programs increase their maximum civil penalties, federal OSHA mandated that the States adopt fed OSHA’s penalty “policies,” such as maximum allowable penalty reductions for small businesses, penalty minimums, discounts for good OSHA history and good faith, etc. Many states resistant to these changes were hoping that the Trump administration would reverse this requirement and permit State OSH Programs to set penalty levels independently from fed OSHA. For now, however, this directive has not been revisited. Because each state has its own legislative or rulemaking process needed to make changes to their regulatory landscape, the various state plans have flexibility when they will increase penalties, and some are just now updating penalties from the first jump a couple of years ago.